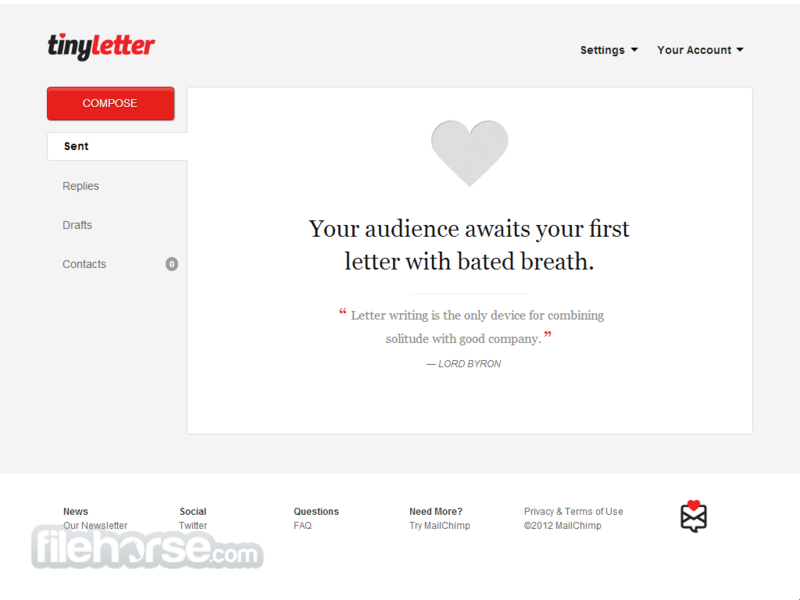 Tinyletter is a simple to use but powerful online e-mail web application that enables you easy way to stay in contact with your friends, family and co-workers with newsletters. Interface and user experience of tinyletter is specifically crafted to give you the best possible way to craft your newsletter with ease and style. Editing tools are simple and easy to use, but the powerful email free services that are offered to you can provide you rich options about the people who read your newsletters and enable you to better control over your message, discussion tools with people who reply on your messages, comprehensive contacts control, build customizable sign-up forms, and off course control every aspect of your newsletter business from any online connected device with modern browser (PC, Mac, iOS and Android). 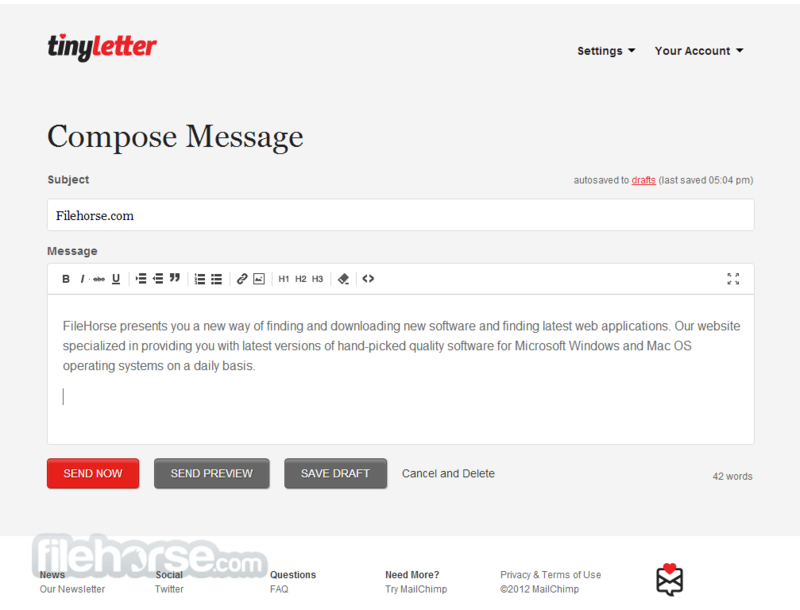 If newsletters are your preferred way of spreading information to your contacts, tinyletter is a perfect webapp for you! Email newsletter distribution for those who like simplicity and speed. After just a few minutes of browsing, we are sure that you will be able to find few of the most popular and influential websites that can help you to distribute your newsletters to your audience. However, if you are a beginning, those sites will most definitely be out of your league – they are too complicated, they offer too much tools, design choices, stats tracking, and countless other things that your small operation will never ever need to utilize. What to do then? Then you need to take a real close look to TinyLetter, online service that was created specifically for beginners and their needs of distributing email content to large amount of people. It offers just the perfect amount of features that you will need - basic text formatting, support for images, and an intuitive control panel from which you can manage to who your emails are delivered to. If you have a small group of subscribers (or even family members and friends that you want to notify with something from time to time), TinyLetter gives you all the needed templates and tools to make that job extremely easy. TinyLetter was founded in 2010 as a newsletter distribution service for beginners and people who are not interested in taking advantage from advanced features that can be found in the most popular email marketing services such as MailChimp, who even managed to purchase TinyLetter! However this purchase managed to not affect TinyLetter in any way because MailChimp still remains top-of-the-line service with complicated controls. 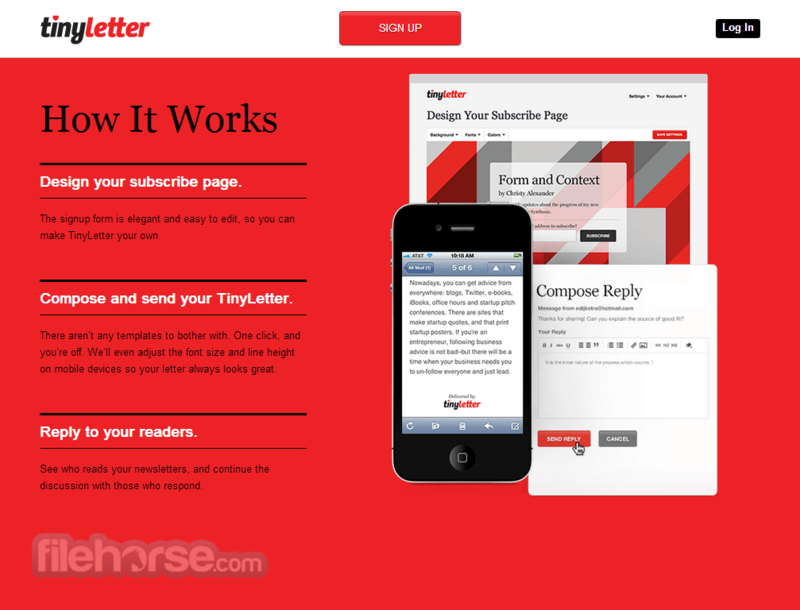 From the moment you arrive on TinyLetter you will know that making newsletter with it will be easy. After account creation you will be be given a page http:/www.tinyletter.com/yourname that everyone will be able to visit and read your newsletters. From that point on you can start creating your content, and inviting people to read it by just sending that URL (either manually over your email, social networks or chat services, or with integrated invite email tool). TinyLetter control center has sections for writing new content, reading replies, stats, importing of email addresses, page for embedded content, and design options. If you are little more ambitious, you can even create paid content, with ability to collect money from subscriber’s trough PayPal (which will limit your audience a little because oflimitations of that payment system). Each email will feature unsubscribe button at its bottom, and users can send comments back by simply replying to your email. All their comments will be featured in your dashboard. TinyLetter’s article editor is very easy to use and intuitive, offering standard set of text formatting options and integrated tool for uploading and embedding images. You can off course, also upload your own images to secondary host and use them inside your articles. At every moment of the writing process you can preview your work. Interface of TinyLetter is simple but effective, with minimal amount of clutter and lots of open space in which you can easily find all the navigational tools and tools. It gives you instant access to all of its features, with just enough functionality to make your newsletter making process fast, intuitive and nicely looking. This no-nonsense approach will be appreciated by both novices and professionals. All TinyLetter services are offered to you for free, but only for your personal use. If you are professional user that needs to service more than 3000 contacts per account, TinyLetter suggests that you switch your operation to their owner MailChimp witch features much powerful tools and cloud support. 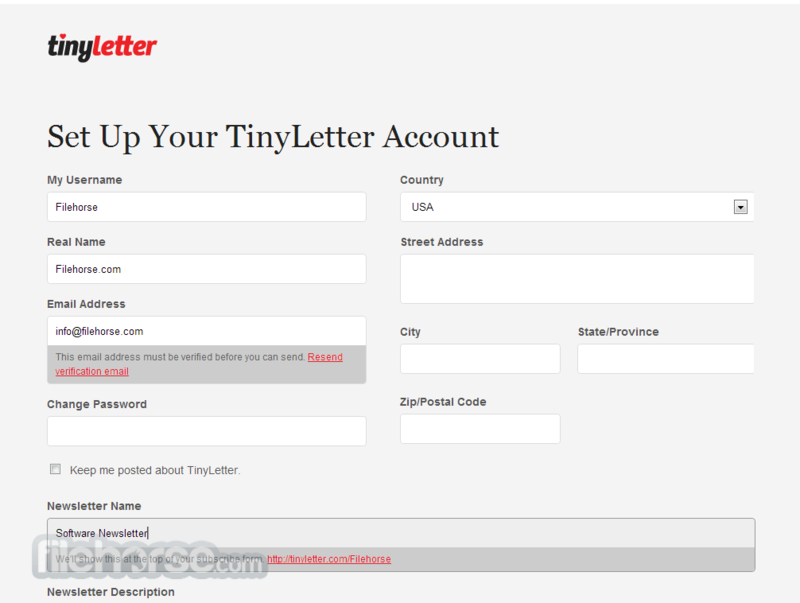 Registration to TinyLetter can be done in mere seconds by just typing in your valid email, username and desired password. There is no possibility of creating account with credentials from popular social networks such as Facebook or Twitter. With all this said, it should be clear to you that TinyLetter is a great service. It offers basic functionality that will not be perfect for everyone, but what it offers gives novices and users will smaller needs a perfect way to create, manage, distribute and communicate using newsletters. Adding to that the fact that you can serve 3000 people for free, TinyLetter definitely deserves your attention. The signup form is elegant and easy to edit, so you can make TinyLetter your own. There aren’t any templates to bother with. One click, and you’re off. We’ll even adjust the font size and line height on mobile devices so your letter always looks great. See who reads your newsletters, and continue the discussion with those who respond.